An appraiser shared an email survey concerning hybrid appraisals. The survey reveals the fees they are thinking of charging. These fees aren’t that different from what I’ve heard elsewhere. It’s actually quite telling on how the AMC/Mortgage Lending industry sees the appraiser’s role in providing a reasonable benchmark on their collateral to make more informed lending decisions. 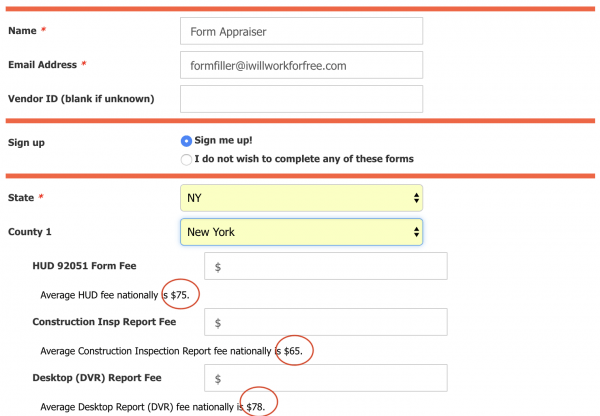 Here’s the scenario – take the $78 national desktop report fee and divide it by the $500 average appraisal fee as quoted by Realtor Magazine. Now think in terms of the inspection versus valuation. valuation expertise is viewed as a commodity and not a skill that takes years to obtain…$78 Valuation / $500 full appraisal = 16%. Don’t get me wrong. Appraisers are willing to work for $78 on desktop valuations but many have little choice in the submarkets they cover. It also shows how the valuation expertise is viewed as a commodity and not a skill that takes years to obtain. The fact the mortgage industry thinks a $78 expense is a reliable expenditure for a reliable valuation suggests we will be looking at a significant mortgage bubble in the future. To all you 16-percenters out there – start taking stock of what you are really worth. I’m not sure if that is a fair generalization. Our industry has been beaten down and commoditized over the last decade that I think many appraisers don’t realize their intrinsic worth. Back around 2012-13 it had gotten really slow and fees were at $250 for a full, $175 for a drive by. So you know what I did went back p/t to my previous profession instead of taking those fees and losing money. Like I always say; it’s your business so do what you have to do, but guess what I won’t feel sorry for you when the agencies that regulate us come a pounding on your door for doing hybrid junk. Your counter is valid but presented in confusing context Koma. I’ll fix it for you. Back around 2012 and 2013, although consumer up front fees for appraisal service remained the same, and even climbed higher, amc’s were defrauding consumers and only paying a minimal 250 or even 175 to appraisers. Pocketing the difference in what would otherwise be an unearned fee or junk fee, if amc’s were properly regulated like everyone else in the chain of mortgage related payments. I’m very thankful to see this Mr Miller posting more articles here, Mr Ford, the dedicated team of licensed appraisers who run this site, and everyone else who is now more frequently participating. Thank you all again. Miracles can happen and just maybe we won’t all need a new career… All I request is two full orders full fee a week. It’s ridiculous when that does not happen. Like Mr Miller posted above, it takes time to see the big picture. I’m reminded of how far I’ve come when I have real world conversations and actually can answer all questions. Real estate is one of the most volatile financial landscapes available, upstarts have no business in the appraisal industry. If you can talk the language of real estate, you can write the language of real estate. Hybrids, evals, typing services, comps sharing, it’s all worthless if the goal is to provide competent informative valuation service. $78/ loan ain’t bad for reviewing a portfolio of say 100. You everyday hardworking guys and gals have to imagine that the future will bring changes. Some of those changes be for mortgage sales of portfolios. Those clients may not be completely reliable and you will have to have contracts with legal consequences for you to remain in business. Don, $78 buy about 1/2 hour of an independent fee appraisers time. Generalized appraiser time – Not expert witness fees. Out of that $78 are overhead which at best is 25% and often as high as 50% – particularly where fast turn times are required and specialized data providers are required to achieve them. It’s not enough to assure any degree of professional competency will be applied. One should never put a hungry man in charge of guarding the buffet table. Integrity will be challenged. I don’t know where you get the idea that hybrid appraisals are “what the basics of appraisals are taught” from. There is NOT ONE SINGLE HYBRID appraisal as promoted by actual users that has been submitted for public critique of its USPAP compliance. Not one. MANY have been shown that are outright frauds. As currently proferred and designed/marketed there is not one that does not promote fraud. Not one. That’s not a “basic of appraisal” I was ever taught. Mike, they want everybody at $30 an hour. And after expenses and taxes they want everybody to make no more than $15 an hour. $7,800 for a package of 100 reviews signalling out the bad from the good is a good fee for any appraiser, not on any form, but on a contract narrative. This would be a (???) hybrid appraisal. Limiting appraisals to any specified format is diminishing the ability of the contractor-appraiser to negotiate a job. Good businessmen are not supposed to be hungry, all sales are!? supposed to be without duress. This hunger you mention has been the downfall of MANY, not a goal. Professionals across the spectrum encourage prosecution as a means of protection their independence and fees. Professionalism is the goal of the Appraiser, NOT technicians. Don I have a single compound adjective that used to get Harry Truman in trouble with his wife Bess to describe the content of your post…but then AB has a no profanity policy. “$7,800 for a package of 100 reviews signalling out the bad from the good is a good fee for any appraiser, not on any form, but on a contract narrative. I don’t even know what the first paragraph is supposed to mean. Signalling [sic] out the bad from the good… Did you mean Singling out the bad from good? $78 dollar “reviews” are going to be PURE GARBAGE with no exception. You are mistaken that anyone wants to limit appraisals to a single format (other than one that is USPAP complaint or formatted toward that objective). What I and others vehemently oppose are formats and offerings that mislead, make false claims and or promote outright fraud…like bifurcated hybrids. Don’t you find it interesting that there is such opposition to hybrids as opposed to so-called Evaluations? There is a reason for that. Evaluations cannot (per FIRREA/PL 103) call themselves ‘appraisals’. We may debate their relative overall quality or validity in comparison to a real appraisal, but they are not inherently flawed out of the gate like hybrids are. To my knowledge, no one is proposing appraisers complete them for $25 to $75 a pop either. Signal out is the proper term for a lender to use in nonacceptance of a parts of a package. A lender or potential lender does negotiate the package for return rate, etc. Appraisals v Evaluations is hybrid foisted on us by the AIREA in an conflict with Websters, Blacks Law, etc. There is no discussion from me about working for an hourly fee, that ridiculous. Competing for business has more aspects than hourly costs. Many have discovered relying on insurance for work quality is UN-reliable with the advent of a lien for fraud. Reputation is developed and fees increased, is sign of growing reputation. I see the future of appraising changing from a letter of approval from an insurance co. back to recourse lending. That would return value decisions to local levels, not wall street projections. Real estate had always been based on local issues, and Real Estate appraisers had local knowledge. Fraud has always been with us and always will be, fraud only has solutions, not cures. A farmer can insure his is wheat crop against hail, and when it hails he can collect something of his loss. E&O insurance won’t protect us against suing, only help in our defense. Learned something new today. Thank you Don. Thank you for the clarification of inside mortgage terms Don. Appraisals v Evaluations was never a hybrid since BY LAW evaluations could never be called appraisals (PL 103 or FIRREA 1989). AIREA has been AI since the late 1980’s I believe. I know it was AIREA when I took courses from them in ’86 and ’87 as a Candidate. It’s doubtful they foisted anything other than an appraisal on anyone back then. They were even opposed to simple comp checks, and especially desk appraisals back in the day. Where you see the future of appraising and where appraisal professionals see it aren’t the same thing. If all RE issues were purely local, we would not have had the S&L crisis nor FIRREA. Both refute the validity of the local statements. Skipping to E&O – it doesn’t defend at all – not meaningfully. It only covers against certain types of loss which THEY determine how to settle. I used to review hybrid products for a company called valuenet. Valuenet is playing these lenders like fools. The reports are garbage. Valuenet is providing lenders with trash and charging them a premium. I would laugh at some of the reports I reviewed. My managers would just say push it thru and let the client decide if its garbage. I later come to find out that one appraiser who had completed over 400 desk appraisals was allowing his teenage son to complete the reports. This is where all that hard wok, education and time spent as an apprentice has lead you! You now can get 50-78 per report? How do you plan on paying for your future? PNC its time to rethink where you get your values from! Thank you for your candid look inside the beast Cotton. Whenever these things are hyped they always cite third-party inspections by ‘closely’ trained “professionals” like brokers or building inspectors rather than the reality of unreliable untrained hustlers that will be playing a numbers game to make the $8.00 to $25 they are offered seem like a livable wage. Once the ‘model’ and concept gain full legal acceptance here, then we will see that firm in Hyderabad that WSJ wrote about doing more $25 hybrids. Hell! We don’t have to wait for that. We already know from the “What is a ClearVal Appraisal” article right here in the blogs that there are some ‘appraisers’ willing to do them for $25 right here in the good ol’ USA. Indiana specifically. I met a certified general appraiser in Colorado who did a variety of all types of work. Not only was his full fee fifty to a hundred less than the low point of C&R, he also used runners when that was not allowable, and had his wife, and his three teen aged kids helping with the production and write up. I sincerely hope you turned him to your the state board. WHY should any honest appraiser be forced to compete with cheaters like that? Because he was my appraiser for my 15, sourced from the trusted lowest rate credit union out there. Whom also just coincidentally used street links. I mentioned this before in other lighting. Same scenario where I tried to insist on the appraiser getting a full fee and the mortgage department was powerless to effect. Generally speaking, no, I never turn anyone into the state boards. I know someone else who did that for obviously egregious work, the state passed the other guy, being new, deserving lower uspap matrix table penalties, and the submitting appraiser was ran through the grinder of review work investigation and lawyers fees for at least the next year. If lenders are willing to allow defrauding of portfolio investors, that’s their business not mine. I only answer for myself, that’s why I have no help and use absolutely no outsourced services of any type what so ever. Baggs, it’s not a case of anyone being a new sheriff or not. It is a case of applying the very same fundamental integrity that you correctly write about often. Turning a liar, cheat and a thief into the state board is not ‘tattling’ or snitching over some minor issues. That illegitimate offspring with no morality or at best selective morality is cheating credit union members, and anyone else he worked for; undermining the integrity of the appraisal profession in the process. Baggs a great deal of the volunteer time I expend on behalf of AGA members is trying to help members defend themselves against false charges. I don’t suggest turning anyone in frivolously or lightly. Repercussions are serious. The ONLY exception to those I’m willing to help are ones that have clearly violated the most basic requirement of being an appraiser…by being dishonest. I don’t want them in my profession. There is no greater offense an appraiser can commit. He’s a criminal just like any hit and run driver is; or a child molester or a bank robber. Turn him in. Agree with the concept and if we can ever get these amc’s out of here, we’ll all be much more able to participate in effective regulatory activity and oversight. As it stands now though, the amc appraiser is by proxy, protected by the amc in these scenarios. David vs Goliath. That’s why I post anonymously, surely I’m on lots of ‘lists’ by now. Funny story, his runner lady showed up, but then got a call, threw the tape measure back in the trunk and drove away fast, then senior CG showed up half hour later. I can’t recreate the rate and for that reason, am hands tied and refuse(d) to move because it’s my home, my equity, my loan engagement. The culture within the appraisal industry promotes this activity. I played nice through that one. The lenders have promoted it by using amc’s. The amc’s promote this activity as standard engagement. Over half of all GSE appraisers (roughly 1/4 of all nationally licensed appraisers) do participate in that kind of working activity. Unethical engagement has become institutionalized at this point. That’s why I could care less about the struggles appraisers have because of their amc engagements. They got exactly what they asked for, and deserved. Baggs, There are parts of the country where if you are an appraiser and do not do AMC work…you simply don’t work more than part-time. I agree AMCs promote (at least passively) the kind of dishonesty we have been discussing. THAT was the whole point behind C&R fees. It is the underlying theme or rationale for opposition to cut-rate services that any competent appraiser KNOWS is going to be an exercise in sidestepping USPAP and hoping not to get caught. Don’t think for a minute that the actions of bad appraisers (at AMCs or otherwise) cannot affect non AMC work. Out here the norm for any narrative pre 2008 was $4,500 minimum. Thanks largely to high volume bottom feeders like MAI owned PCV Murcor, the ability to command much more than $2500 to $3500 for those same appraisals in NON AMC C&I work has become far less frequent. An argument can be made that C&R is now only <$3,500 (at least as a probable base). It was like that in CO for many years. We stood up and said no more. I was not the only one whom solicited directly and de prioritized amc’s during a sustained market rush. Already though, amc’s are trying to drive raised fee schedules lower w/ no regard for tripled cost of living expenses. Amc’s are their own worst enemy. Right when they’re actually needed is when they are least effective. If appraisers want alternatives, all they need to do is market directly and learn to say no. If they don’t work, I have a tiny violin to play for them. I did not sacrifice over 5 years of full time marketing for part time work for nothing. I’ll find a new line of work before I turn back. Lessons learned. Mike, you don’t have to go out of state (CA) for low fees as Pro Teck Valuation Services wants to pay vendors $55. For fun reading, check out the forms they require. Bradford (ClickFORMS): Pro Teck Desktop Appraisal Report or Pro Teck Desktop Restricted Appraisal Report. Bill, it is absolutely NO different than the bifurcated appraisals we oppose. “Desktop appraisal with Inspection.” Think about that term for a minute. I also take exception to their advertising claim that clients and regulators alike are all embracing this type of product. WHY are providers of this garbage continually finding it necessary to lie or mislead about what their so called products are? Oh! NOW I understand. Bill you said they pay $55 for these “USPAP Compliant” pony-loaf er products? “AVM cascades remain the “go to” application for many AVM uses, including Home Equity lending. But using cascading AVMs as a method for choosing which valuation tool to use for a given property carries with it some unintended and unpleasant consequences. Most, but not all properties are viable candidates for AVM use and lenders need to determine whether or not an AVM is an appropriate property valuation tool for the subject property before engaging any AVM. An eval is not always reliable because… Strike that. Just go with it, evals are edgy and trendy now. Here, and here. Stale reading. I just skimmed it, read it all before. I liked the FNC paper more because that was written before the amc industry and lending industry alike realized they could monetize those practices at levels far exceeding just skimming appraisal fees and kickbacks from amc engagements. Special treat, I found the white paper without needing to provide login. But you could always use an @mailinator.com address if you still hold true to the bugmenot mindset. Errr… Wait, they have two of them this year. This is the one being discussed in the link, my bad. As they’re both just clever marketing solicitations masquerading as white papers, well, it can be easy to confuse them. The author of course, is not an appraiser. The AMC model is based on a pimp economy. The pimp always gets the largest share of the fees while the whore gets used and abused. No other professional is treated like this, but then we are living in a greedy environment, working with our hands tied behind our backs while they latch onto our backs like leeches. Bloodsuckers will die if we don’t let them dictate our fees or quality of work, and don’t try to compete with artificial intelligence with delivery dates that won’t allow you to digest the information and perform meaningful analysis – the non-experts are clueless when it comes to even ordering an appraisal, yet, non-licensed people are “reviewing” our work, mining our data and profiting on our qualifications without just compensation. Stow your feelings hurt language. We’re not playing victims here. Let me fix it for you; The actions amc’s engage in would otherwise be illegal activity if they were mortgage bankers, lenders, or title insurers. Clear capital are you listening????? We do not want to work for you or your below market rate fees. Do not pass go, do not collect $100 and go straight to hell with the rest of the jackass AMCs. Why is nobody listening?????? That is why. They sell appraisers hook line and sinker on optimal income and efficiency. When the bubble pops, appraisers like this Andy fellow will be left holding the bag. Everyone involved with appraisals should have individual licenses, right down to the distribution clerks, and all the way up through the tech development ladder. Dude! Commercial Appraiser, that document was rich and quite the gem to whip out 15 years later. In the hands of non qualified order management clerks and regular level mortgage bankers, the artificial neuron becomes a hedonistic neuron. Just saying, by observing results, we effect results, mostly because the various persons tinkering with parameters do not understand these advanced concepts or fundamental building blocks and operational guidelines of their own products and systems. One imagines that if lenders and clerks had to pass basic testing demonstrating effective fundamental understanding of the core operational principals of their own software offerings, almost everyone industry wide would fail. The hubris of wannabe tech people daring to explain the value of their latest software and hardware which even they do not clearly understand, well, that’s been going around for some time now. Next story Is Mr. Brian Coester Being Honest?